All this week , PBS NewsHour premieres a special 5-part series, “Rethinking College: Closing the Graduation Gap,” which profiles five leading edge experiments aimed at improving educational and career opportunities for students. Thursday, the series focused on the DirectConnect to UCF program. To see the video click here. 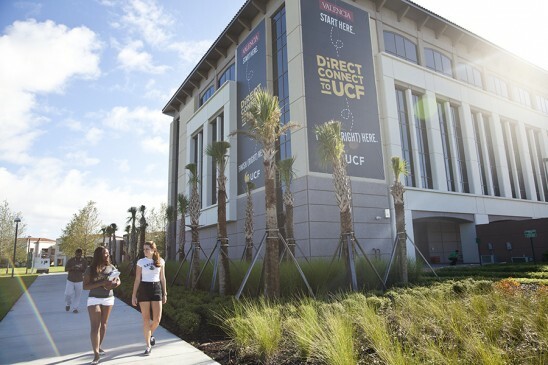 DirectConnect to UCF is a nationally recognized program that guarantees admission into UCF for students graduating from one of the four institutions. The state college partners – Eastern Florida State College, Lake Sumter State College, Seminole State College, Valencia College – prepared about 70 percent of the more than 10,000 students who transferred to UCF in 2012-2013. Daytona State College has since joined as a fifth state college partner. Monday: How the University of Texas at Austin figured out what’s keeping their low income students from graduating and built a leadership network that’s decreasing the dropout rate. Tuesday: How is it that 500 high schools seniors are graduating with an Associate’s degree and 3,000 of their peers are enrolled in college courses, in a town on the Mexico border were the odds are against them? Wednesday: What happens when a school stops giving out aid for merit and just focuses on need? Thursday: Transferring credits between community college and university is a huge problem. See how a community college and the University of Central Florida are fixing it. Friday: How did ASU, the largest university in America, restructure to prepare for the future while increasing acceptance and graduation rates for students from all income backgrounds?